September 16, 2017  No need to RSVP: Here's your ticket to the WMOT Roots Radio 89.5 Birthday Bash, live from the Americana Music Festival and Conference in Nashville, Tenn.
October 20, 2014  The prolific composer, respected educator and nationally beloved fiddler performs live on stage. July 5, 2013  The violinist joins host Michael Feinstein to play Fats Waller's "Ain't Misbehavin'" and more. July 3, 2009  Classical violinist Mark O'Connor's boyhood hero was a country musician. O'Connor says that he'd spend hours on end learning the songs of Johnny Cash — and to this day, his great passion is the tune "Big River." March 20, 2009  Mark O'Connor's new Americana Symphony follows the spirit of America's historic westward expansion and the music it engendered. The fiddler says he's trying to identify something long overlooked in classical music — our native language. November 21, 2007  This week, From the Top comes from San Antonio, Texas. The talented Texans include a 16-year-old baritone from Fort Worth performing Handel and a 16-year-old clarinetist from Duncanville, playing Carl Maria von Weber. 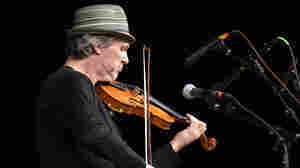 And a special guest, the composer and fiddler Mark O'Connor, makes music with all of the kids on today's show. This program originally aired Apr. 4, 2007. July 18, 2007  Among the many high-profile artists with whom Mark O'Connor has collaborated is American soprano Renee Fleming. For her he wrote the song "The Meadow," about a transformative place where there's hope to meet one's beloved once again. O'Connor and pianist Chris O'Riley perform with From the Top students, including baritone Thomas Shivone. This segment originally aired on Apr. 4, 2007. 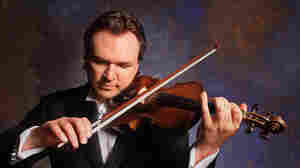 February 16, 2003  Mark O'Connor has spent quality time as a Nashville fiddler, a rocker with The Dixie Dregs, and as a classical violinist. His new CD, In Full Swing, jumps into jazz with the help of trumpeter Wynton Marsalis and vocalist Jane Monheit. 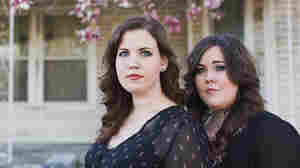 NPR's Liane Hansen talks with O'Connor about his varied career and the Hot Swing Trio. January 3, 2011  Widely recognized in multiple genres, the violinist and composer never stays in one place too long. 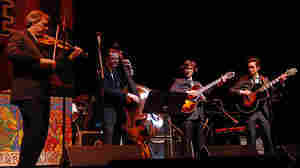 The former Stephane Grappelli student performs hot swing standards and a few originals with his jazz band. 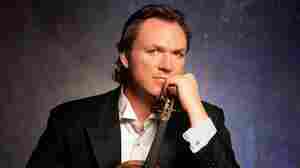 April 26, 2010  American violinist Mark O'Connor has been a sideman for country stars and a soloist with symphony orchestras. He has made 36 albums. Now comes his biggest project yet: He wants to change the way young people learn how to play his instrument.